The views from the western sea facing room were wonderful! The view, the rooms, restaurant for dinner and breakfast on the patio! We enjoyed the beautiful view. The resort was convenient to the bus stop for any trips into town. Breakfast was decent and dinner was tasty. Did not have a room with a view, but our room was clean with newer furniture. Breathing views, beautiful scenery, good value ! Loved it, will come here again. Great views! Clean large room was fantastic. If you don’t have a car, check the bus schedule or get the taxis number. It’s about $20 Euros to take you to the town, $30 Euros after 8pm. Loved the simplicity of the place in beautiful natural surroundings and sceneries, out of the noise and crowds. In company of cats and dogs. We had a nice terrasse with a beautiful view and sunbeds. Staff are very friendly and helpful. The food at the restaurant was delicious and the view spectacular. 2 words - amazing views! 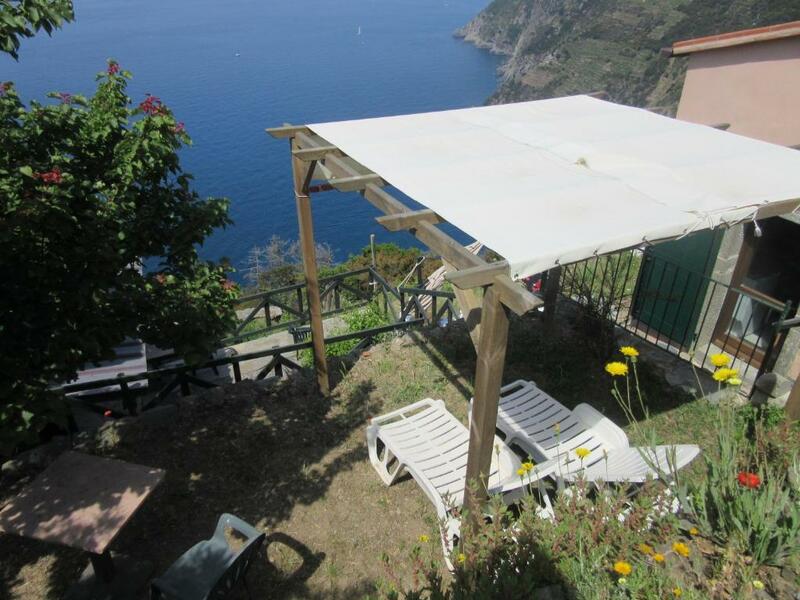 The location is lovely, a little far from Riomaggiore, the 1st of the Cinque Terre villages (10 minutes by bus). Note is is very difficult to park in the villages and the walk is quite difficult so you will likely need to rely on the bus and the last one is quite early. We would have also loved to be able to swim on location but there is no pool and the sea is quite a long and difficult way down. But worth going there, can't say it enough, the views are incredible!! Rooms are a bit old but fine for a night or 2. The view was absolutely spectacular. Rooms were unique -- keep in mind you are in a national park. The restaurant was beautiful and had a nice selection. The staff was very friendly and helpful. Our kids loved the location and were able to swim and cliff jump nearby. Lock in a great price for Il Borgo Di Campi – rated 8.1 by recent guests! One of our top picks in Riomaggiore.On the SP370 road at an altitude of 295 yards, Il Borgo di Campi is located 2.5 miles up from Riomaggiore within the Cinque Terre National Park. On clear days, the views include the Tuscan Archipelago Islands and Corsica. Il Borgo is a former countryside hamlet surrounded by olive groves and vineyards. It was completely renovated preserving the local architecture. Simply furnished, the accommodations overlook the Liguran Sea. Each studio or apartment features a kitchenette, satellite TV, and a furnished garden or terrace. The restaurant serves delicious local dishes and wines. During pleasant weather, meals are served on the panoramic terrace. A public minibus service connects the Borgo di Campi with Riomaggiore. The schedule is available at the front desk, where scooters can also be rented. Free parking is available on site. To reach the apartments from the front desk, guests must go down a 200-step staircase with panoramic views. When would you like to stay at Il Borgo Di Campi? This simply furnished apartment features a private garden or terrace equipped with table, chairs and sun umbrellas. The apartment includes a kitchenette, satellite TV and a bathroom with shower. It has a separate bedroom and a living room with a double sofa bed. Air conditioning is only available in July and August. Featuring a garden, this simply furnished studio includes a kitchenette, satellite TV and a bathroom with shower. Smaller studio with 140-cm-wide bed. It has simple furnishings and a kitchenette. Questo luogo ancora oggi è da considerarsi unico. Essendo nel Parco Nazionale, la ristrutturazione ha dovuto rispettare le indicazioni, a volte incomprensibili, dell'amministrazione locale. La natura qui è rigogliosa, la vista del mare appagante e rilassante. Per questo noi consigliamo questo piccolo paradiso solo a coloro che desiderano la tranquillità, e desiderano disintossicarsi dalla frenesia della vita quotidiana. In ogni modo Riomaggiore è a pochi minuti da qui, Portovenere, più vivace, a mezz'oretta. E la versilia anche, per chi desiderasse tuffarsi nella vita notturna. Per i camminatori poi, la posizione è ideale. Un sentiero parte dal nostro parcheggio, privato e gratuito, e raggiunge i sentieri n. 3 e n. 1 che congiunge le Cinqueterre col Golfo dei Poeti. Consigliamo di lasciare l'auto nel parcheggio durante il soggiorno, e servirsi del bus per Riomaggiore. Nei villaggi il parcheggio è spesso introvabile, il parcheggio costoso, e le multe possibili. Noi siamo comunque a disposizione durante gli orari di reception per dare utili indicazioni. Vi aspettiamo. Ma i tacchi alti.....lasciateli in macchina ! Nel nostro ristorante troverete una cucina genuina. Noi coltiviamo le nostre erbe aromatiche che sono un ingrediente essenziale dei nostri piatti. E nel nostro, poco, tempo libero, ci dedichiamo alla vigna e agli ulivi. 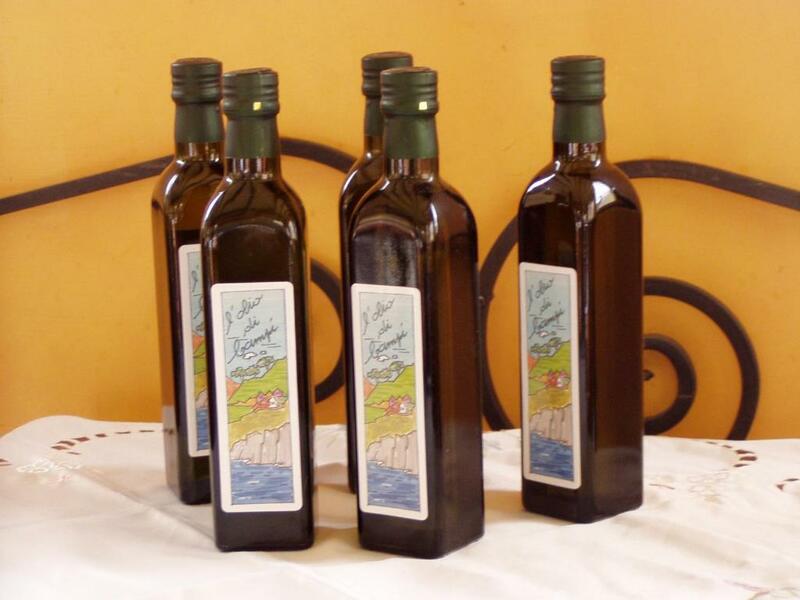 Produciamo il nostro olio extra vergine di oliva e il nostro vino dolce da desser, il tipico chiaccetrà, degustabile nel ristorante. La cittadina di La Spezia, dove arrivano tutte le autostrade, ultimamente sta migliorando il suo aspetto. Grazie anche all'arrivo di parecchie navi da crociera. Propone cinema, teatro, musei, e nel centro storico diversi wine-bar che degustare il tipico vino ligure. Dalla stazione di La Spezia, il cui parcheggio sotterraneo è abbastanza economico, si può partire per visitare le cinqueterre, senza lo stess di dover parcheggiare nei villaggi, chiusi al traffico, e scendere a piedi. La posizione del Borgo di Campi è un crocevia vincente per potersi muovere e spaziare dalla Liguria alla Toscana. House Rules Il Borgo Di Campi takes special requests – add in the next step! Il Borgo Di Campi accepts these cards and reserves the right to temporarily hold an amount prior to arrival. Please note, air conditioning is only available in July and August. To reach the apartments from reception, guests must go down a 200-step staircase. Fabulous host and location! Best you can find, in Cinque Terre! The room was fantastic as were the views. The food was a little disappointing as was the breakfast. The cakes were covered in flies and the milk and yogurts were not in ice tubs. I was expecting a bungalow with a view of the sea and got one below with a view of a private garden, so a bit misleading. Also the downstairs bungalow was quite mouldy smelling after being closed up for the day. Great food at the restaurant and view from the terrace. Everything was perfect! Amazing place! Amazing views! Will definitely comeback! I don't know why do people rate this accomodation so low. It was an amazing place, just as we imagined, and way more. We were worried a little bit about it before we arrived, because of the reviews, but we shouldn't had to. It was clean, it was well-equipped, romantic and friendly. The bed was huge and very comfortable :) Our apartman was ~100 steps away from the main entrance and I must say, it wasn't really too much walking (and I'm pregnant, so if I could do it everyday min. 6x, then everybody should). We were amazed by the view and we would definetely come back anytime. Amazing view to wake up with. Good breakfast. Parking available just across the road. I would have liked coffee/tea, cream and sugar fixing in our room at the very least. Also, soap and shampoo would be helpful. Lots of bugs, shower was way too small, too many stairs, inconvenient reception hours. Restaurant was amazing and so was the view in the day time. Friendly staff. Convenient bus stop nearby. Poor management, unfriendly and rude staff, poor and terrible breakfast, uncomfortable bed and pillow. Bathroom very small, broken soap bottle that is filled a couple of times (yes they don't care to use a proper soap dispenser). Too many bugs in the room. too many stairs to the room, and it's dark in the evening without enough light. too far from anywhere. no cafe or restaurant around for lunch or a tasty breakfast. Taxi or bust is not always available to get out of hotel and they are too expensive to the nearest town. A massive list! - Staff: Most of the hotel staff are quite unprofessional and rude. The young Italian guy who is mostly working in the restaurant is unbelievably aggressive and impolite. He tried to charge us extra at the dinner table without even informing us. After complaining, he said he is charging us extra because we are taking his time at paying the table's check and his time is very precious! The lady serving breakfast is standing and counting the number of pieces of bread, cakes, cheese, etc. you take and stares at you! Not to mention that you cannot take more than "one" coffee or tea at the breakfast. The follow-up drinks are not free! The breakfast is absolutely minimum for 7.5 euros/day. - There is all sort of hidden fees. They don't clean the rooms and change towels. You need to pay for new towels. You need to pay for a second toilet paper roll! Also, you need to pay 20 euros for not cleaning the kitchen, or not putting garbage out, or not properly sorting it out !!! It seems room service is wrongly understood in Italy and the guest's responsibility! - They don't add city tax to the invoice! something is fishy there. - Rooms are pretty inconsistent regarding the equipment. We rented 6 rooms at the same price (80,- per night). Some rooms have TV, A/C, Fan, etc and some don't. Some rooms are big, some are like the rat hole. Some rooms have a balcony and some don't. Some rooms have a good bed and some have crappy beds. Some rooms are renovated and very clean, some are old and humid or stink. - The hotel is located quite far from the first village or from the town. The only way to get there is a bus which doesn't even run the whole day. The view is good though. - The hotel bar/restaurant/... is not always working. They are open very selectively. There is pretty much nothing to drink, eat or buy in the hotel out of those hours. You have to travel to the town/village by taxi/bus. View, but it is something that you can find everywhere in Cinque Terre. The hotel is no place to spend the whole day in, because there is no room service, no restaurant, no bar, no other services around. To lower the Luggage down into the room. Lack of salt and spices in the room. Lamp lights from outdoor and the noise from the nearby air conditioner passed through the open window of the bedroom. It's the second time I'm here, Panoramic view from terrace was excelent. It was very cute to climb up&down by feet to the local beach (250m+250m). Our terrace was gorgeous. The staff was very friendly. We did not know we would be charged for bread at dinner. We were also not told about having to remove our own trash from our room before we checked out. You are charged, if you don't remove it. 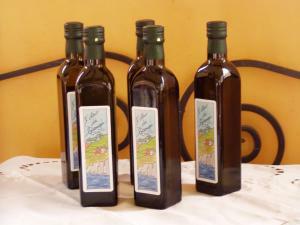 For a resort that produces their own olive oil, it would have been nice to sample the resort's own olive oil for dinner. We were given an olive oil from another company that was not very tasty.